A New York City loft featuring extensive and varied concrete applications implemented by Get Real Surfaces of New York was selected as a Top Ten Project of 2009 by ConcreteNetwork.com. Among Get Real products and services contributing to the versatile, elegant, and spacious living quarters are cast-in-place concrete kitchen countertops and island, plus precast backsplash panels. In addition, a trowel-applied concrete microtopping finish on the fireplace surround and bathroom walls replicates the look of concrete without added weight or thickness. For all the finishes, custom colors were developed in coordination with NYC-based architect Judy Gerrard of Gerrard + Tan Architects. Regarding selection of the Top Ten Projects, Khara Dizmon, director of Communications for ConcreteNetwork.com, explains, We were looking for projects that met one or more of the following criteria: Concrete used (1) extensively and in a variety of ways; (2) in an unconventional application; (3) in an outrageous pattern/design; and/or (4) to solve a unique challenge. 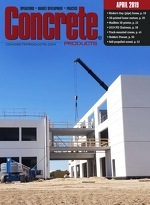 The ConcreteNetwork.com is an independent web service whose stated purpose is to educate homeowners, contractors, builders, and designers on popular concrete techniques and applications. Earning a position on the Top Ten Projects list while meeting the owners' design demands for multifunctional, cleanly defined, and open living spaces, the 4,000-sq.-ft. loft apartment was recognized both for extensive use of concrete in various settings and its unconventional application to walls and other vertical surfaces. Affirms architect Judith Gerrard, Concrete appealed to the owners because it could be used to create horizontal and vertical finishes that are refined, monolithic and minimalist. Moreover, the concrete could be customized in color and texture to support the colors and material palette of the job. Get Real Surfaces professionals worked closely with the architect to develop a series of custom colors for all of the apartment's concrete finishes. Brilliant white kitchen counter and island surfaces were achieved by adding a titanium pigment to ready mixed used for the installations. Counters then were coated with a no-VOC, food-safe sealer. A pigmented cementitious base with added acrylic polymers in the concrete finish for bathroom walls and the fireplace surround allowed use of the material in potentially wet locations, such as showers, and on curved surfaces with no cracking. The finish for vertical features was applied with a steel trowel at a ?-in. thickness, similar to Venetian plaster. While eliminating excessive weight, the trowel-applied finishes provide concrete's subtle texture in the desired color.